This post is not sponsored by Honest diapers! As a parent of an adorable little human, you know that there are many expenses and just as many messes. You may wonder how to save money while also providing your child with the most environmentally friendly products. More than any other item, diapers are top on your list of "what is most expensive about this precious little creature" and you may also notice how most normal disposable diapers cause regular rashes. The good news is that there are great biodegradable diapers out there and one such brand that you can trust for affordability and quality are the Honest diapers. We whole-heartedly give them a 5-star rating. They may have their flaws, but they include all of the features that are important in a diaper brand that promises healthy, eco-friendly, and functional disposable diapers. It has hypoallergenic material which helps to prevent rashes. The absorbent quality keeps pee and poo from leaking. The cute designs are fun and friendly. They are some of the eco-friendliest diapers available. Bio-based wheat/corn in core helps to keep the baby fresh and to absorb pee. The moisture barrier cuffs help to prevent leakage. How do they benefit you and your baby? How long does a package of a diapers last? One of the factors about the Honest diapers that helps them to stand out is that they are truly some of the best biodegradable diapers on the market. Because of their eco-friendly material with hypoallergenic material, they help to protect your baby from rashes that are typically caused by chemical-filled diapers. Diapers with chemicals are often chosen by parents because they promise to block odor and while this may be true in most cases, the results from your baby wearing diapers with chemicals is not a fun experience. That is why biodegradable and eco-friendly diapers made from hypoallergenic materials are much better and beneficial for your baby. The bio-based wheat/corn core not only helps to absorb your baby's pee and poo, but it also helps to keep them feeling fresh even after they have relieved themselves. They may not be as cheap as other diapers that you can find at the supermarket, but as a parent who cares about the environment and what is being used on your baby, they are worth the slight extra cost. The Honest diapers are as easy-to-use as any other diaper around. You can typically get a 40-44 count diaper package which can last for 5 days to more than a week depending on your child's habits. You can also choose smaller packages with 16 diapers, but in relation to return on the cost and time spent ordering, it's smarter to choose the 40-count package. They fasten well, are easy to change, and for the quality and benefits they provide, are an affordable option for parents. One of the first things that parents want to know when purchasing diapers is if they will get the job done. The Honest diapers have had their moments of leakage, but this is typically due to hurried diaper changes or the size not fitting your baby right. What can ensure that they don't leak and are reliable is to always check that you have the flags on the side pulled out and the closures fastened correctly. Some parents may find that the Honest diapers run on the smaller size, so be aware when choosing your baby's diapers. Another factor to consider is that these diapers don't have a wetness indicator, but this may not be an important feature for every parent. Other than these factors that have solutions, the Honest diapers are highly absorbent and effective in keeping your baby rash-free. They work well in most cases and many parents may find that they never experience leakage or blow-outs. Because the honest diapers come in a variety of packages, it depends on the option that you choose. Most parents like to go for the bundle package, but there are smaller packages available if you are just looking for disposable diapers for trips. Typically, a baby may go through about 4 or 5 diapers a day depending on their daily peeing and pooing habits. This is one area where Honest diapers shine. They excel in cute designs for both female and male babies, as well as with gender neutral designs. From anchors to skulls, giraffes, crossbones, and even plain designs, the Honest company ensures that baby always looks cute-even when just in their undies. With other eco-friendly diapers found on the market, you may question how the Honest diapers compare. The truth is that each brand has something special for different needs. 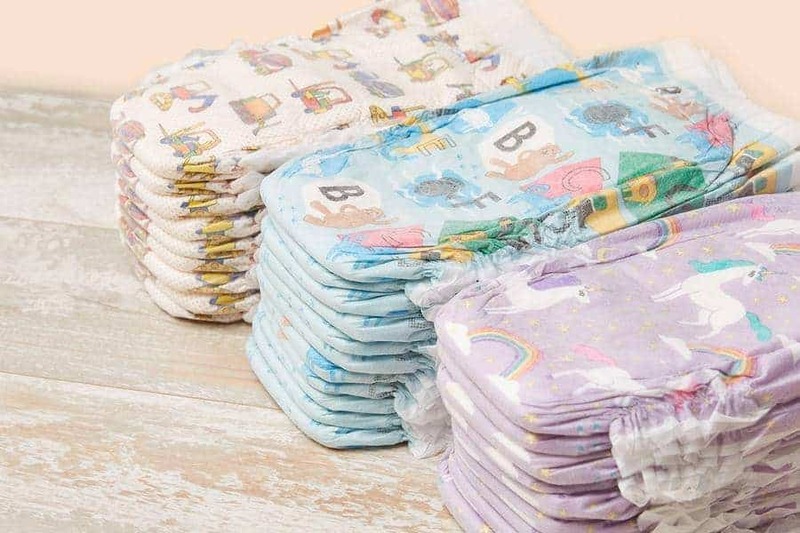 For example, the Honest diaper brand is the best eco-friendly diaper around for babies that are older than six months, but for parents with newborns, you may want to choose gDiapers which offer a washable exterior while using a disposable interior. This helps to make it easy to clean newborn babies who have more frequent messy messes than older babies and is also a more reliable option for keeping the diaper in place. Another two disposable options for babies are Nature Babycare diapers and Bambo Nature diapers. Nature Babycare provides high absorbency disposable diapers but feels fragile with its thin exterior. The Bambo Nature diapers are great when it comes to absorbency and hypoallergenic materials, but runs on the large side. For older babies, the Honest diapers are some of the best because of how great they are for babies and because they have no chemicals, your baby will never get a rash. If your little one is still very little, you may want to go with the fun gDiapers option.